Introduction Established in 1968 in Newton Abbot, Devon, Hotline has a strong customer-focused approach with both its distributors and those using its products because we believe that engaging with those in the field ultimately results in successful product development and happy customers. Approachability and flexibility are the two key attributes with which we approach customer service and in an industry largely dominated by products originating from Asian or Eastern European manufacturers, we have a reputation for a quality, British-made product. 2013 We have introduced several new products for 2013. The Raptor range of fence energisers has been developed to simplify the decision a customer makes when choosing between the various power supply options. Raptor will operate from mains power, 12v battery power and from an internal 6v battery. The energiser also features a rotating fence monitor which gives the user a visual information on how the fence is performing. Raptor is available in four different power options. We think the combination offers a level of flexibility and ease of use which is unique in the electric fencing market. We have also upgraded our long-standing P range of battery energisers. The Harrier and Super Hawk have increased power and now operate from a 12v battery, in addition to the traditional 6 and 9v disposable batteries. The change offers a greater level of sustainability and flexibility and enables both to be used with solar assist panels. The Harrier, Super Hawk, Falcon and Buzzard now feature customer replaceable battery connection leads. The Merlin, now also with increased power, and Hobby have been upgraded to utilise the Raptor case. All energisers now have a 3 year warranty! energisers Mains or battery? Battery energisers are extremely portable and offer a range of options from 6v and 9v models with disposable batteries to 12v rechargeable models and solar options. As energiser power levels rise, it is increasingly difficult to draw power from battery alone while maintaining a practical battery life. Mains energisers have a greater pool of power to draw from so climb to greater power levels. Installation of mains energisers is often seen as impractical as many believe a power source is required adjacent to the fence. This does not need to be the case. Using HT lead (page 14) a mains energiser operates much like a battery energiser but with extra long earth and fence leads. Ht lead operates just as an insulated , efficient extension of your fence line and can similarly be many metres in length. Mains energisers are also extremely cost effective to run. guidance Voltage under load: The fence line ‘loads’ the energiser and brings the line voltage down. The level at which this occurs is influenced by length of fence, the type of fence line and the amount of inefficiencies along the fence. Fences with greater metal content offer less resistance to the voltage per metre so represent comparably less load over a distance. Undergrowth touching the line completes the circuit drawing power to ground, increasing the load and reducing the effective voltage on the fence line. Wooden posts will also draw power to ground if touching the fence. When choosing an energiser, consider the application and the likelihood of extraneous conditions that may influence the fence. For instance; poultry netting is very close to the ground and susceptible to grass taking power to ground and thus loads the energiser heavily. The energiser required for this application must be much higher in joules than would be needed on most fences of comparable distance. Stored and output joules. This is the level of energy the energiser produces and releases onto the fence line. Many energisers have similar voltage levels but the higher the joule the further the voltage will be pushed and the greater ‘load’ the energiser will effectively cope with. Earthing: We recommend a minimum of one 1m earth stake with all energisers (see page 22) Solar assist compatible: see page 10 Netting: The estimated number of nets the energiser will power. Netting is relatively low on metal content and closer to the ground than other forms of fence so generally requires more power to achieve effective fence voltage. We have based our estimations on the practical experiences gleaned from our customers in the field rather than a theoretical figure. Netting can be separated into 2 base configurations, sheep for larger spaced netting and poultry for closely spaced netting. Warranty: All energisers have a 3 year warranty. Warranty cards should be filled out and returned or alternatively visit www.hotline-fencing.co.uk/warranty.aspx ,fill out the online form and receive a further 6 months warranty free of charge. super merlin specification A 12v mid powered energiser with 6v internal battery back up. super hobby specification Very popular single output, mid power 12v energiser. Good battery life, power balance. MB60 specification Medium power 12v energiser. The Raptor energisers have been designed to offer the highest level of flexibility, quality and simplicity of operation. Raptor will operate from 12v external battery, 230v AC adaptor and from an internal 6v spring top battery. Our innovative three colour rotating LED relays information on the health of your fence system at a glance. All of these features are housed in a ABS case of unrivalled strength. Compare the quality with any other energisers in the market and ask yourself why settle for anything less? The three colour rotating LED rotates with every pulse, showing how much effective voltage you have on the fence line. A central LED flashes red when your 12v battery is low or when the energiser is running from the 6v internal battery. If operating from the 230v adaptor and have a 6v battery inserted, the LED will indicate that the energiser is operating on battery back up. 6v 40 amp hour battery for Harrier. Provides up to 15 weeks power. Twin, maintenancefree 35ah leisure batteries with battery charger. 12v batteries: We recommend 12v leisure batteries for electric fence applications. This type of battery is designed to be repeatedly discharged and recharged rather than trickle charged like an automotive battery, within which the cells would begin to break down. All battery life figures quoted for 12v units are based on 75 amp hour batteries. Ah - Amp hour: Greater amp hour figures indicate a longer battery life. If you are tired of expending electricity and muscle power bringing your energiser batteries in to charge then solar power is your answer. We offer simple solar assist panels which connect directly to your 12v battery, extending the period between battery charges or cutting out the need for battery charges altogether. The level at which the panel will extend the life of your battery is dependent on the power of your fencer and the duration and strength of available light. The stronger the fencer, the more quickly it will draw power from the battery and the less time the panel has to replace the charge. The ability of the panel to produce and replace the energy used by your energiser is indicated by the watt capacity of the panel, so a 10 watt panel will replace the charge quicker than a 5 watt. Dependent on strength of sunlight, the 5 watt panel will extend the battery life of a 0.5 joule fencer up to 200%, but to achieve an autonomous system higher watt panels can be used in conjunction with a charge controller allowing a more rapid replacement of charge but without over-charging the battery. The Hotline 20w panel is supplied with a fitted charge controller. Panels are supplied with a sturdy mounting stand. Part no. mains energisers lead out cable - under-gate cable HT lead is used to efficiently transfer power over distance or to continue power across spaces such as gates. The cable is in effect part of your live fence, like your tape, wire or net, but insulated to 18,000v to allow you to bury or run the wire without shorting. It is required when installing mains energisers. Essentials 1m ground stake requ. NEW 1m ground stake requ. 3 1m ground stake requ. Phoenix The Phoenix range of mains powered energisers offer the traditional Hotline reliability paired with the most up to date electric fence technology. Available in two fixed joule models and an intelligent variable joule model, Phoenix incorporates an unparalleled level of function for a standalone product. All Phoenix have 4 user defined alarm settings which alert you to changing conditions on the fence. Settings are accessed through a simple twin button, scroll menu displayed on a large LCD screen which also displays fence information. In addition, the bright LED bar gives an â&#x20AC;&#x2DC;at-a-glanceâ&#x20AC;&#x2122; indication of fence performance. All Phoenix have a 12v battery backup facility for further peace of mind in the event of power failure. Command & Communicate module can also be installed in all Phoenix models. With the addition of a standard SIM card, the unique internally installed GSM unit relays alarm information via text allowing you to respond instantly to alarm conditions and potential problems. The system is also invaluable for on the spot maintenance as the fence can be switched off from any location to allow work to proceed in safety. The system will also relay up to date status reports to your mobile when requested. 110 decibel external siren and strobe for Phoenix. Interfaces with the phoenix and activated by all alarm conditions. testers There are three main types of electric fence tester. Proximity testers such as the beeper detect energy from a short distance and emit a sound or display an LED to show the presence of power. These are useful in offering a quick indication that a fence is on, but are inadequate for fault finding or actual voltage readings. Testers such as the 6 â&#x20AC;&#x2DC;lite are fitted with ground probes to connect earth and fence - much as an animal does when shocked. If designed with multiple lights, this type of tester indicates the amount of voltage present on the fence and can be used to find faults. The tester can be employed to test the fence, the energiser itself and the earth, allowing the user to single out the element causing the problem. Self earthing units such as the fence scout and digital tester use the body to make the earth connection allowing quick and accurate readings. Application of these units range from simple digital Kv reading to giving a direction indication of the fence fault. The fence scout displays Kv reading, amp reading and an arrow to lead you in the direction of the fault. Indicates voltage levels on your fence via six neon lights. fault finder Self earthing digital Kv tester. voltage indicator Flashes with each pulse of the fence. Flashes to indicate the fence is operating at an effective level. Stops flashing when voltage drops below 3kv. All plastic post. 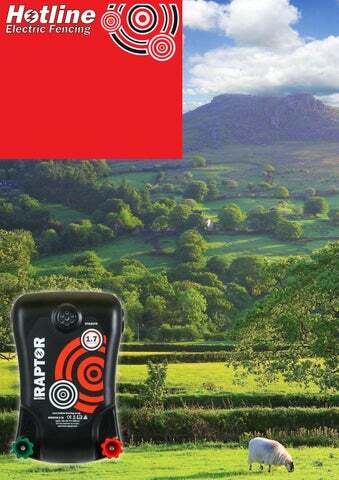 Ideal for gardens, ponds, and badger and rabbit systems. Plastic pvc post. 12mm dia. Trusted Hotline multiwire post design manufactured from recycled plastic. Multiwire plastic post with stirrup style tread in. Available in two sizes. Powder coated steel post with welded foot plate. Use with adjustable insulators for semi permanent pig and predator systems. Galvanised spring steel post with tread-in and insulated pigtail . Powder coated steel live post with welded foot plate. Live shaft to deter pushing. Powder coated steel post with welded foot plate and plastic pigtail insulator. Powder coated steel post with formed tread in and plastic insulator. bobbin insulator Saddle insulator with integral nail. Suitable for polywire. live insulator Replacement insulator for pigtail and zigzag posts. replacement insulator for live post. Adjustable insulator for metal post 47P310. Suitable for rope and wire. small bobbin insulator Permanent staple insulator for poly and galvanised wire. Includes staples. Small nail on bobbin type insulator for polywire. Includes nails. ring insulator Reinforced screw-in ring insulator. Suitable for wire and rope. Screw-in ring insulator. Suitable for wire and rope. bolt on ring insulator Bolt on ring insulator. Suitable for wire and rope. Tube insulator with staples. Suitable for wire up to 3mm Also available in 2m. lengths. insulators ring insulator with tape fitting Screw in ring insulator suitable for wire, rope and tape up to 20mm. Premium nail on tape insulator with overlock mechanism. Suitable for tape up to 40mm and rope. Nail-on or screw-in tape insulator. Premium screw in tape insulator with 180mm off-set and over-lock mechanism. Suitable for rope and tape up to 40mm. Premium screw in tape insulator with overlock mechanism. Suitable for tape up to 40mm and rope. Nail on insulator with broad back plate for greater insulation from the post. 200mm off set insulator suitable for wire and rope. Screw in ring insulator with 180mm offset suitable for wire, rope and tape up to 20mm. Available screw-in for wooden posts and bolt on for metal. corner-end strainer insulator High strain insulator for end posts and corners. Suitable for rope and wire. clamp insulator Straining insulator for corners and terminations. clamp insulator with buckle Clamp insulator with connection buckle. Suitable for tape up to 40mm. Clamp for maintaining tension within the fence line. For tape up to 40mm. end tensioning insulator Insulator with tensioning buckle for securing at end posts. earthing grounding Grounding a fence system is perhaps the most overlooked aspect of building an electric fence. This is possibly because the terminology is similar to that of household electric and implies safety role rather than an integral part of fence operation. The fence line is only one half of the circuit â&#x20AC;&#x201C; the ground is the other. The two together form an open circuit which is completed, like a switch, when the animal touches both. The fence line operates efficiently as the electricity is carried through highly conductive filaments but on return the pulse is carried through the ground itself. This is a very variable medium which is affected by weather conditions, geology and the extent of the earth system installed. In dry conditions the ground conducts poorly so it is always recommended to at least install the ground stake(s) in damp soil. We recommend a minimum of one 1 metre earth stake for any fence application at at least 1m in depth as the top soil is the most susceptible to change. A fence can only be improved by adding multiple stakes linked with wire driven as deep into the earth is possible. Multiple stakes should be placed 2m apart. Long fences may require the installation of an ground return wire along the length of the fence to provide an efficient medium for the pulse to return to the energiser. Ground stakes are installed periodically along the length of the return wire minimising the amount of actual ground the pulse needs to travel. T section ground stake 9mm dia. ground stake with wing nut and bolt connection. Available in 0.5 metre and 1 metre lengths. Heavy duty T section ground stake with bolt connection. 1 & 1.5 metre. insulator chuck Outdoor safe cut-out switch with twin output. Speed chuck for ring insulators. crocodile clips Plastic crocodile clips with stainless steel jaws. 1.2m insulated net gate system. Allows easy access into net enclosures without the need to disconnect the energiser. Compatible with all poultry nets. Premium gate handle with tape fitting buckle. tape gate Gate handle and anchors with spring. Extends up to 5m. Insulator with gate anchor and tape fit fitting. Premium quality insulated gate handle. Tape gate kit. Ex Extends up to 6m. roller gate Extendable bungee rope gate. Extends up to 6m. Self retracting gate. Extends up to 5m. Available with rope or 40mm tape. ratchet tensioner In-line tensioner for polywire and tape up to 10mm. Heavy duty ratchet galva tensioner for galvanised wire. Connector for rope up to 6mm dia. connecting buckle Tape connection buckles. Essential for joining tape without power loss. Twin bolt stainless steel connector for rope and wire. reel bracket 1:1 ratio version of geared reel. Quick fixing bracket for premi premium reels. Interfaces with reel fixing post (47PR2) and can also be screwed onto wooden posts. Qty Part no. Plastic reel for dividing paddocks. Hooks onto existing fence. Multi-line connectors for rope and wire. Connects up to 3 lines. Premium reel with UV spool warranty. Geared 3:1 ratio for bringing the fence line efficiently and quickly. 200m (up to 20mm) tape capacity and up to 800m polywire capacity. Connector for connecting 2 lines of tape. Suitable for tape up to 40mm. ABS reel with metal frame and clutch. Fits reel fixing post (47PR2) and metal posts. The practical and flexible way of protecting existing fences, hedges and walls and for subdividing fields or creating temporary enclosures. 3reel systems come complete and packaged in one carton with the wire pre-wound for easy installation. tape rope & wire tape rope and wire Tape, rope or wire, what do you choose? All conduct a charge in the same way, what differs is the medium within which the conductors are carried. The primary concern is visibility. For many animals an electric fence acts as a psychological barrier and they have to be able to see it to avoid it. This is also a consideration when considering colour â&#x20AC;&#x201C; a product with a low visual impact from a human point is also much harder for an animal to see. Products which offer a higher contrast with the surrounding environment are more likely to be effective. Tapes and ropes are more common in equine applications and both have pros and cons. Tape offers the greater range of visibility as it is available up to 40mm in width and as such is often used as alternative to traditional fencing. As its profile is wide and flat it is susceptible to catching the wind which overtime can break down the conductors, as can constant moving and re-erecting. Many Hotline tapes have thick polyurethane webbing with extra thick edging to extend the life of the fence. Rope is a very good alternative to tape and what is lost on visibility is made up for in durability. Poly-tapes, ropes and wires conduct power through thin metal conductors running through the length. The more metal in a fence line the more efficient it will be. Steel conductors have a good balance of conductivity and tensile strength and copper (usually nickel plated) conducts extremely well but has a lower tensile strength. Products with a combination of the two aim to take advantage of the strength of steel while using the copper to reduce the overall resistance of the product. Resistance is measured in Ohms. A lower Ohm value indicates the product offers less resistance to the energy flowing through it and thus will take the power further. paddock tape White or green paddock tape with stainless steel conductors. Premium super durable tape with thick stainless steel conductors. Available in white or green. Premium white/ green & white rope with stainless steel and copper conductors. paddock wire Polywire with 3 stainless steel conductors. Polywire with 6 stainless steel conductors. galvanised wire 7 strand galvanised steel wire. Maleable wire which is easy to work with and highly conductive. 2.5mm high tensile steel wire 2.5mm high tensile wire. Comes on a wooden spool for easy use. No spinning jenny required. posthole borer Powder coated steel borer with 150mm (6â&#x20AC;?) helix. Heavy duty line tensioner for galvanised and tensile wire. gripple tool Lightweight Gripple gear-drive tension tool with torq tension gauge. for connection of high tensile wire, barbed wire and stock fence. Medium - 2 - 3.25mm wire. 400 kg max. load. Large 3.254.2mm. 600kg max. load. Paddock Essentials is a range of high quality products offered at economy prices. The range is small but is designed to cover most applications, perfect for stockists wishing to hold a small capsule range which will offer the customer a simple solution. White paddock rope with 6 stainless steel conductors. netting poultry netting Electric netting is the ideal option for those keeping a small amount of birds in a domestic setting, preferring a solution which can be moved and stored easily and has a low visual impact. Available in green and orange, poultry net has 14 integral posts and a gate post allowing a small section of net to be hinged out for access. 13 ground pins repair kit. How it works The net is manufactured from polyurethane with metal filaments running through the horizontal strands (apart from the bottom base line). This is mounted on PVC posts. To ‘charge’ the net an energiser is connected to the net and to the ground via an earth stake. This forms an open circuit. When an animal comes into contact with the net and ground it completes the circuit and gets a shock. This is why the net itself does not need to be erected in a loop and can be erected in a straight line if required. The energiser produces a high voltage pulse approximately once every second. Foxes, like most animals, investigate unfamiliar additions to their environment and it is at this point the shock is delivered. Although the net is not of insurmountable height, once the animal has been shocked the net will be a sufficient enough psychological barrier that the animal will be unlikely to attempt a breech. considerations As the live lines of poultry netting are very close to the ground they are susceptible to ‘leakage’. This is where undergrowth completes the loop and draws power from the fence to ground. We recommend a minimum of 3,500v on your fence to provide an effective deterrent. The higher the joule rating on your energiser the greater level of ‘leakage’ your system will cope with and maintain an effective voltage. The bottom line is not live but all other horizontal lines are. The key is trying to keep the live ones clear of any external contacts. This can be difficult, especially on undulating ground as your bottom line is effectively covering a shorter linear distance to the top line which causes the net to sag. You may need to add extra posts and/or corner posts to achieve better tension. In some cases keeping the lowest live line free from vegetation is impossible and isolation from the live matrix may be needed. This is achieved by simply cutting the line at the first and last post. You can reconnect if needed by using the ferrules in the supplied repair kit. The increasing popularity of electric poultry netting in domestic settings has highlighted potential dangers for some small animals. Amphibians and small mammals have been known to get trapped while attempting to navigate through the lowest section of net and in some cases have died as a result of receiving multiple shocks. This problem can be resolved by erecting a low barrier in front of the net or by disconnecting the lowest line as outlined above. deluxe poultry nets with ‘Hot - Gate’ system Our deluxe poultry nets have been conceived with ease of use in mind. In addition to the Hot-Gate system, the 16m, 25m and 36m nets incorporate four reinforced 19mm corner posts within the net. These nets can be erected quickly and rigidly minimising sag and leakage problems. The 50m net has a built in ‘Hot - Gate’ but has the normal compliment of posts found on the standard net. 50m Contents ● 50m deluxe poultry net with Hot-Gate (see above) ● 47HLC120 Gemini Energiser ● 47KV10 tester ● 3 47CP112 19mm double spike posts ● 5 47PMPBL additional standard net posts ● 47ES2 earth spike ● Ground skewers, pegs and corner guys & warning sign. corner posts Extra rigid, double spike corner posts for poultry nets. 19mm dia. PVC posts made slightly higher than the net to help lift to top line and reduce sagging. Where possible, try to erect the net angled in the direction of the incoming animal. This should deter the rabbit getting in close enough to chew the base line or burrow under the net. tail tape Coloured identification tape. Reinforced with fibre but easy to tear. Available in five colours 10m rolls. explorer dual torch Halogen rechargeable torch with LED working light. systems building a system We hope the following pages will help to show how products combine to form systems. The examples are by no means exhaustive or specific to the animals we have suggested, so you can take different elements to provide a solution that is best for you. The wire heights are also a guide, these to can be modified to best suit your animals or combined if you wish to keep or to protect from more than one type of animal. All animals behave differently, use electric fencing to out wit them and take into consideration how the animal is likely to contact the fence. For example, when rabbits jump they are free from earth contact and immune from shock. By wiring a line to earth the animal will receive a shock from 2 wires rather than the ground and wire. The key elements of an electric fence are sufficient voltage to provide a deterrent and visibility, so the animal can learn to avoid the fence. Twin zone isolation switch with indoor mains insulation, tape and rope gates (with power transference). systems fox protection For those wishing to protect a small number of poultry and want to move the enclosure from time to time, netting is the best solution (page 28). It is also easy to re-enforce an existing mesh run with two offset wires, linking the mesh to the earth stake to provide a good contact for climbing animals. It is crucial to site your enclosure away from hedges, walls or out buildings which may provide a handy launch pad into your birds. Keeping the fence energised at all times will ensure the fox does not have the freedom to find a way in. Metal posts for strip grazing*, insulators for polywire, short off sets for clearance for safe clearance of stock fence. *Live posts are used intermittently to deter animals pushing over posts. fence checker fence checker If you are having problems with your fence the check list below should help you find the problem. Having a fence tester will help rule out elements of your system as problematic. It is not advisable to test the fence by touching it especially as your footwear will insulate you and misrepresent the true impact Is the energiser turned on? Please turn on. Turning the energiser on is essential for effective operation. Is the energiser emitting an audible â&#x20AC;&#x2DC;tickâ&#x20AC;&#x2122;? Is there a light flashing on the unit? Please phone our service dept. Your energiser seems to be working it is likely the fault is with your fence line or your earth. check What type of fence are you using? Is your energiser powerful enough to power your fence requirement? Refer to the energiser guidelines to see if it is operating within distance parameters. Certain type of wires/tapes are also only suitable over limited distances as they are higher in resistance. Netting is particularly thirsty for power, we recommend a minimum of 0.5 stored joules for 50m of poultry net. Is the fence line touching something that is taking power to earth? Your wire, tape, rope or net needs to be as clear as possible from any external contact which is not insulated from the ground. This includes wooden posts, sheds, arks. Check the line is positioned in the insulators correctly, that all insulators are intact and undergrowth is as free as possible from the live lines. Any contact will draw power from your fence. Have you joins and/or breaks in the fence line ? When joining sections of plastic tape, rope or wire it is preferable to use the correct connector or buckle. This ensures all of the metal conductors in one side connects with all of the conductors in the next and power is efficiently transferred without loss. The metal conductors can also break over time reducing efficiency, walk the line looking for patches of wear which may be causing a constriction in the voltage flow. Do you have an ineffective earth system? Poor earthing results in loss of voltage. We recommend a minimum of one independent, 1 metre stake. Using the metal stand on an energiser will be variable because of the changeable topsoil conditions. A building earth should not be used or the frame of metal buildings. If you detect voltage on or get a shock from your earth stake it is indicative of a ineffective earth and can be rectified by adding further earth stakes and linking them together. Increasing the earth stakes in your system can only improve the performance of the fence. The table below indicates the operation distances for examples of energisers with specific fenceline materials in typical conditions (typical earth, ground conditions and general inefficiencies). Figures are in metres.